The Irish will soon vote on a President and blasphemy. 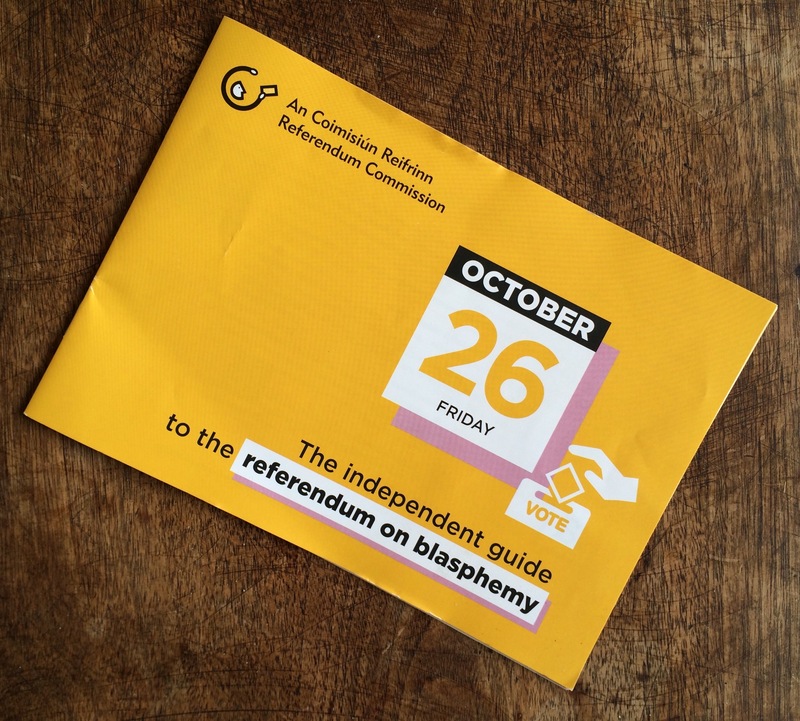 When I saw the referendum guide land in the post over here my first thought was that in the 2016 US election we got something of a package deal that’s gone from bad to horrendous. In spite of popular and ubiquitous epitaths like Jesus, Mary, and Joseph!, Christ on a bike!, and Jesus feckin Christ!, blasphemy is currently illegal in Ireland and subject to a fine up to €25,000. I doubt many have been so fined and perhaps that’s reason for the upcoming referendum to remove the word ‘blasphemous’ from the Constitution. The referendum is expected to pass. The right of citizens to express freely their convictions and opinions. The publication or utterance of blasphemous, (this word would be removed with a ‘yes’ vote) seditious, or indecent matter is an offence which shall be punishable in accordance with law. The education of public opinion. Common good. Morality. It seems in the States we’ve stepped beyond these ideals to embrace a narrative and public discourse that is blasphemous to the core. And it is a matter of grave import.